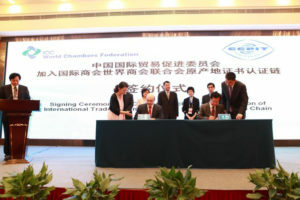 The China Council for the Promotion of International Trade (CCPIT) officially joined the ICC WCF International CO Chain on 16 May 2013 in Kunshan, during the 2013 China International Import Expo. The CO protocol was signed by ICC Secretary General Jean-Guy Carrier and Xu Wei, Director General of the Legal Affairs Department of CCPIT/CCOIC (China Chamber of International Commerce). Officials from the CO Council, CCPIT and representatives from China’s Customs and Ministry of Foreign Affairs departments witnessed the signing. The CO Council’s Chair Lee Ju Song welcomed the latest addition to the Committee, acknowledging the CCPIT’s role as a pioneering member of the CO Chain, and a member of the International CO Accreditation Committee. “With this membership status, CCPIT sends a strong statement that it is not only part of the CO Global Network but is leading the global CO Network of Chambers as trusted and competent authorities in the issuance of COs based on the ICC WCF International CO Guidelines,” Ms Lee said. The CO Guidelines give assurance to customs administrations, banks and importers of the independent, reliable, responsible, transparent and accountable issuance of CO.
“No other organization is better placed than CCPIT to send this strong statement as CCPIT issues the world’s largest number of COs. CCPIT enjoyed a healthy growth of 15% to reach a record high of 3.8 million COs in 2012,” Ms Lee added. As a member of the Accreditation Committee, the CCPIT will help to develop the work of the CO Accreditation Chain. The CO Chain was launched in early 2012 as a means to strengthen the global integrity and trust of the CO network, and reinforce the status of chambers as the competent, trusted third party with neutrality in the delivery of COs based on internationally accepted best practices. It also seeks to give greater international credibility to COs issued.